Many anglers owning vodomotornomu technique, we believe that the motor boat is an indulgence and is only for people with a limited budget in the presence of small boats and fishing on the waters of a small square. Since the advent of electric outboard motors there are many stereotypes and misconceptions that try to consider within this material. The first electric motor for boat appeared in 1881. It was created by a French fisherman and a lover of boats Gustav Truve. In fact, it was the first outboard engine, which was used for movement on the pond. Further development of motors happened gradually. They constantly competed with internal combustion engines. However, after so many years since their creation, some anglers still don’t understand why the need for the electric drive and what advantages it has? The minimum weight that allows without any difficulty to carry it in your hands and set the boat on light duty. Small size, because it does not take up much space when transporting in the car and storing at home or in the garage. Does not require significant costs during operation, does not need fuel and lots of fuel and lubricants. It is not necessary to conservation of the engine before long-term storage in the winter. The cost of a full set of electric motor and battery about two times less than the petrol engine. In addition, the outboard motor is trouble-free in use. high maneuverability and ease of control. Battery charge is enough for one, at least two of fishing. This nuance, you should consider going to a long check-out on the water. Low movement speed. The electric motor allows you to move up to 5-7 km/h. You can’t use fast flow, strong wind and high waves. Given these shortcomings of the electric motor, it is advisable to purchase as extra or use in such circumstances, where considered negative factors do not exist. Boat electric motors can be used as primary and secondary. In the first case, the motor is mounted on a small boat, usually inflatable, and allows you to move without physical effort. It gives you the opportunity to save on fuel and, due to the small dimensions and weight do not bother when you carry, install and operate. Electric motor for inflatable boats current in small ponds do not require long passages and new promising point, you can swim slowly for a few moments. With this engine you can slowly move in the waters, oblasova any places where the potential bite of a predator. Tip! The electric motor effective when fly fishing from a drifting boat a cautious predator, ASP, Chub, trout and others. Boat electric used for lake and river trolling. Such a motor can quietly and slowly move along the bottom of the vegetation or other promising areas. In this case, is not required to bear the cost of gasoline, not tired from the constant noise from the engine, not the effort spent on control of vehicles. As an additional electric motor is used when fly fishing in the vast waters. To move between split-plots using a petrol engine large power, and to harvest selected areas is activated, the actuator enabling at low speed to explore the area, constantly making casts lures to a potentially promising point. Electric boat is very reliable and durable. The control unit is to change the speed of rotation of the propeller. Depending on the model of the motor, it may have a function of reverse or, in other words, reverse. The number of revolutions of the engine is changed smoothly or stepwise. The tiller is designed to control the boat in the process of moving over the pond. Some models have a telescopic handle that allows you to adjust its length to fit your needs, located in the boat as comfortable as possible. The motor mount needed to install it on the transom of the boat. In all models electric motors of his design is a little different. It allows you to securely and safely lock the drive. Tip! Electric motors for boats made of PVC are installed on the transom. On large ships, where the electric outboard motor used as an additional, it is better to fix on the nose of the craft. By means of foot control unit is connected with the motor located at the bottom of the motor. On the shaft is mounted with the propeller rotating during movement over the pond. It is possible to raise or submerge to the desired depth by the sliding rod. We should also discuss the design of the screw. The electric motors use two-bladed “propellers”. Their manufacturers are positioned as a fully nezatseplyayki. This, of course, a publicity stunt. However, when moving in shallow water, covered with algae, it is much less winded grass than on the classic mounted on a gasoline engine. The first is similar to the petrol engine. In it, a throttle is installed on the tiller, which also is maneuvering the boat in the process of movement. The electric motor does not need to have, he is always ready for operation, just turn the knob and add a speed. Foot system involves the use of a special pedal that is connected to the control unit. With its help, the angler performs the bends, the choice of travel mode and switching speeds. The advantage of this option is the possibility of continuous fishing during the movement of the waters. How to install the motor on the boat? Fix electric motor on the vessel is very simple. It can be installed on any boat, even one which has a hinged transom. Important to make sure that the mounting screws were tight. They should be periodically check and tighten, preventing inadvertent unwinding. Using outboard electric motor as an extra, it can be installed not only on the transom. Practiced a variant of the engine mount on the nose of the ship. Often this method is observed in our Western colleagues, lovers of fishing large-mouth bass or maskinonge. All modern motors on the market are divided into price categories. Budget or initial category. Motors have low power, which is in the range of 0.5 HP there is no smooth switching speed, they can’t be used as an independent means of transportation. Apply as an extra for continuous movement on the waters and the implementation of fishing. The mid-price category. Have on average power up to 1 HP have the smooth adjustment of speed. Can be used as main engine on small boats when fishing in restricted waters. Advanced and elite level. 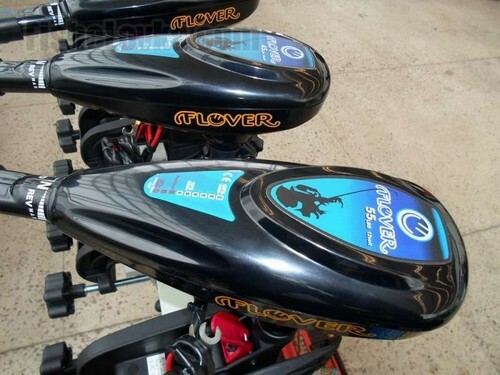 The motors reach a capacity of 3 HP Used by professional fishermen as a secondary, rarely primary. Often mounted on the bow of the boat and used during the harvest phase, allowing you to slowly move in a given direction. Have improved performance, various extra options and functions. Today not so many manufacturers produce high-quality electric motors for boats. Most engines do not meet the expectations of anglers and do not meet basic requirements. When choosing a particular model of motor it is necessary to consider the boat on which it is installed, the maximum capacity of the battery and the duration of work, the firm-manufacturer, the build quality of engine and components. Experienced users of electric motors note some features of their application. The motors with a stepped gear shifting it is strongly recommended not to “jump” from one mode to another. Turnovers should turn smoothly and in order, because the engine itself and the battery don’t like such abrupt changes. All things should be evenly distributed in the boat that the motor was easier to pull the boat. So will “squeeze” his engine much more. It is desirable to move in third gear. This saves battery power. Monitor the brush motor and to periodically change them. Be sure to follow the screw, and if necessary to clean it from dirt and debris. Times per season should be maintenance of motor, drying and lubricating the drive. Observance of these simple rules and recommendations will extend the service life of the electric motor, and the angler will not have to incur additional expenses in repairs.